I’ve seen these all over the Web and decided it was time for me to try melting crayons onto canvas. It was really fun and easy! I drew on my initial and painted the background blue. I then glued crayons to the top and covered the letter “L” with cardboard and painters tape to keep crayon wax from messing up my letter (Some wax still got into the letter but it wasn’t too bad). I painted the letter “L” with a pinkish-red color and outlined it with a black paint pen in an attempt to hide some of the wax on the edge of the letter. 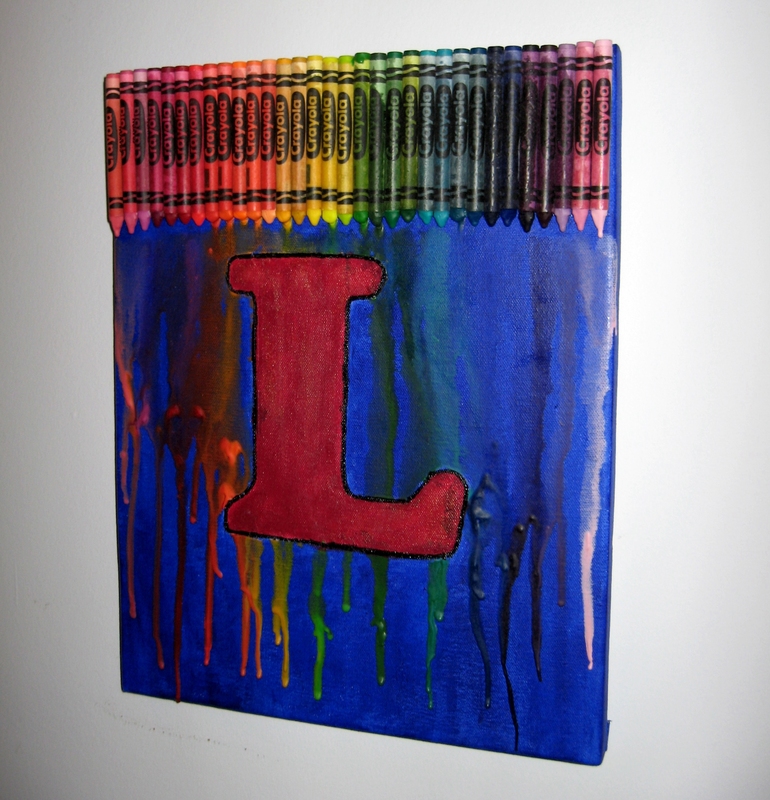 And voila, I have my very own personalized, melted crayon art. I am currently in the process of re-doing my bathroom. While that is nowhere near complete, I decided to make this post about one of the accessories that will be going into it when/if my bathroom is ever finished. I found this metal bathroom stand near a garbage can on move-out day in college and decided to take it home with me and use it the following semester. Since I am re-doing my bathroom anyway, I decided to try and paint this sucker. In my excitement, I forgot to take a picture of the plain metal stand but here’s a picture of it primed (you get the general idea). 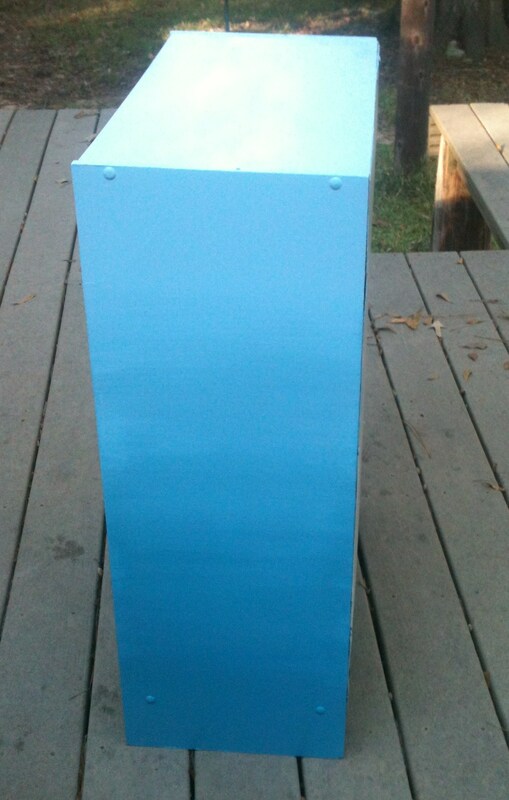 The four tiers gave me the idea to paint the stand with various shades of one color. I picked red because I think it will look good in my made-over bathroom. The colors don’t look completely accurate on the computer. The first layer is light red and it gets darker on each tier below. I used a metal spray primer and then painted it with acrylic paints and protected it with an acrylic sealer. I like that this ombre stand was super easy to paint and will add a pop of color to my bathroom. I decided to line another bookshelf with gift wrap. This time I went for more of a country feel with this yellow, floral paper. I used the same method as before to adhere the wrapping paper (you can find that post here). 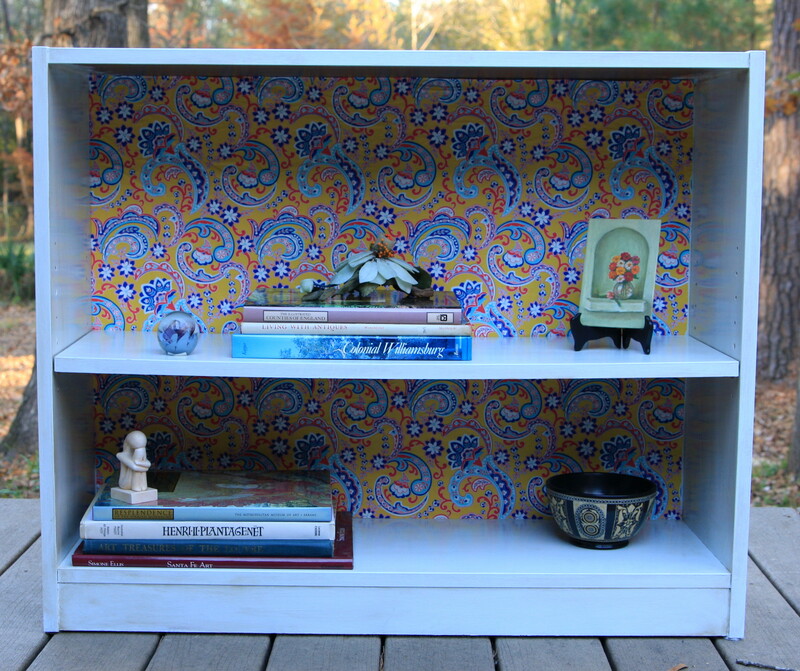 This bookcase is also laminate, so I primed and painted it. Keeping in mind that I wanted it to look more country than the last bookshelf, I used the “dirty cowboy” technique from Domestic Imperfection. It’s hard to see the difference it made in my pictures, but it’s noticeable in person. It’s really apparent on Domestic Imperfection, so I suggest you go there and learn how to make your furniture grungy-chic. Lately, I’ve been on a furniture kick. I see all sorts of nifty projects online and think “I can do that” and it’s about time I try! 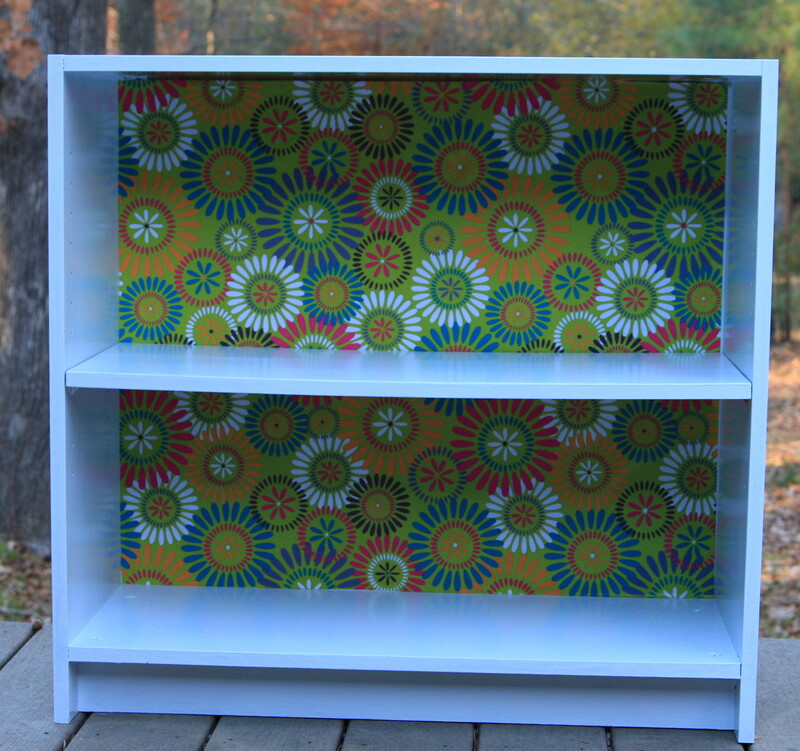 So, when I saw this blog about how to line dresser drawers with gift wrap, I was inspired to get to work. 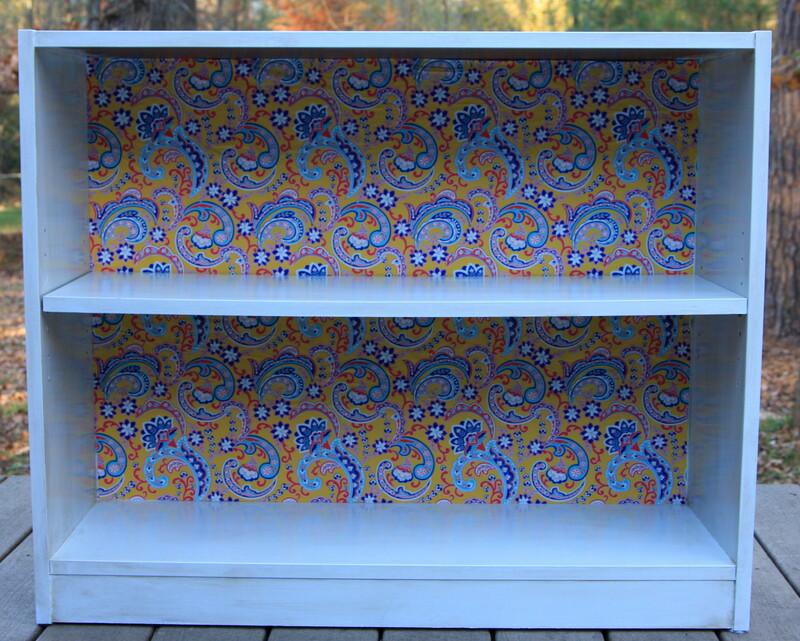 I decided to line the back of a bookshelf instead of the inside of drawers. I picked a laminate bookcase I’ve had for years with the idea that it wouldn’t be the end of the world if I completely screwed up this project. My mom had some leftover paint she wanted used up, so I decided to sand, prime, and paint my bookcase before applying the gift wrap. Now, the fun part! I cut the wrapping paper to fit the inside of the bookcase. I then used a foam brush to put a light layer of matte Mod Podge on a portion of the bottom of the bookshelf and fit part of the wrapping paper to it. I worked my way up in sections instead of putting Mod Podge on the entire inside. This gave me a little more control over the bubbling and crinkling. After getting the paper in, I let it dry for about fifteen minutes then put a thin coat of Mod Podge on top of the paper. I repeated this process a few times letting it dry between coats and smoothing as I went. I had never used Mod Podge before, so I didn’t invest in a brayer but used an old ID card to smooth the paper from the middle to the outside. I imagine my method works on smaller projects, but I would go ahead and invest in a brayer (I don’t think they are very expensive) if you’re doing a larger project like this one, because I still had some bubbling. Even though I had some crinkling, it’s not noticeable unless you are looking for it and won’t be noticeable at all once there are books on the shelves. The last thing I did was clean up the sides with an exacto knife and spray the back a few times with an acrylic sealer. I recommend doing this. The paper feels sturdier like it won’t rip with a lot of use. 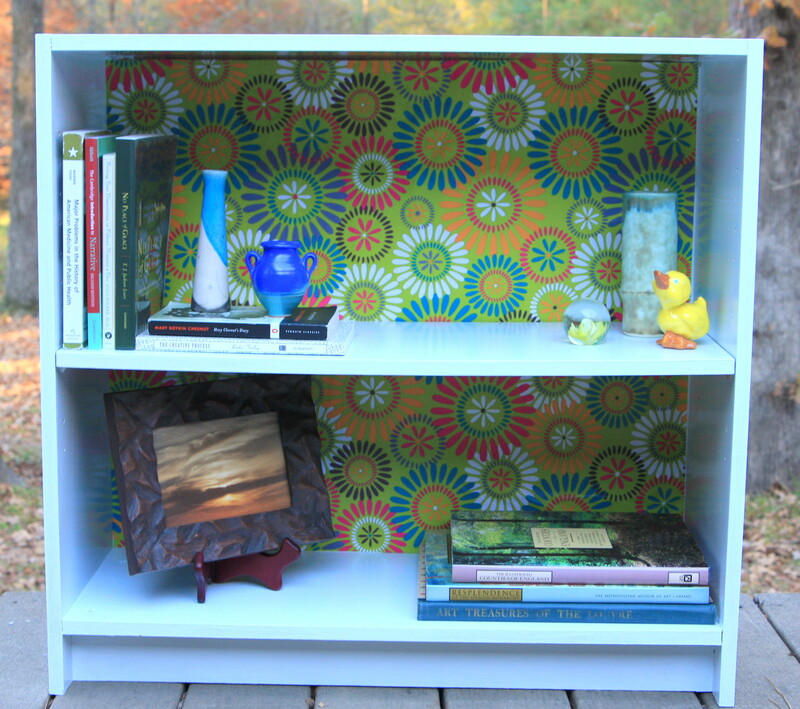 I love the fun paper on my upcycled laminate bookcase; it really brightens my space. For those of you who don’t know, exam week at a college or university is the best time to find freebies. 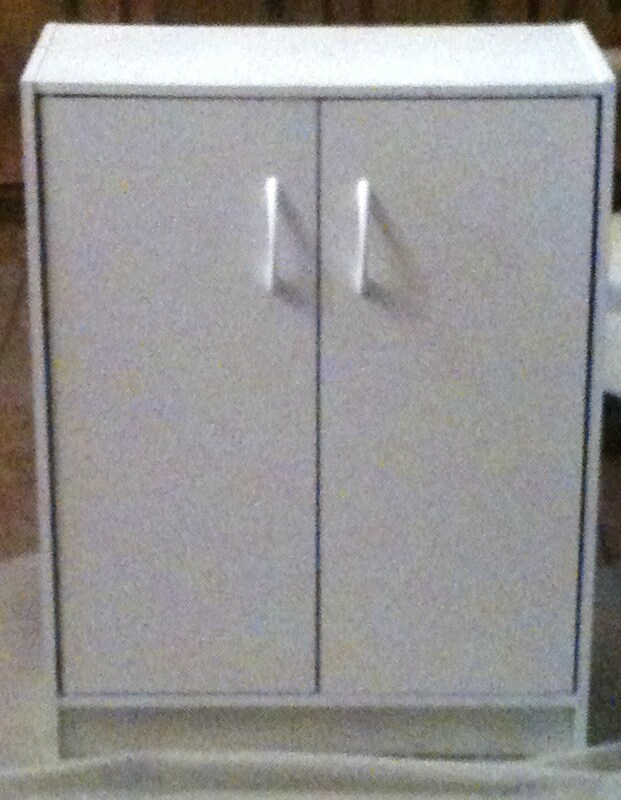 Students, especially seniors, cleaning out their dorm rooms often throw away some pretty decent items, like this cabinet! I found it sitting in the hallway by a trashcan (Don’t worry. I checked on it throughout the day to make sure that it was really “trash” and not just waiting to be hauled to someone’s truck). Just my luck, it was up for grabs and I was more than happy to give it a home in my dorm room. When I was particularly stressed with papers and tests, I often looked at this white cabinet and thought about all of the possibilities it presented. All I could think about was art therapy and how I wanted to paint it rather than write papers. Now that I am out of school, that cabinet is getting a makeover! 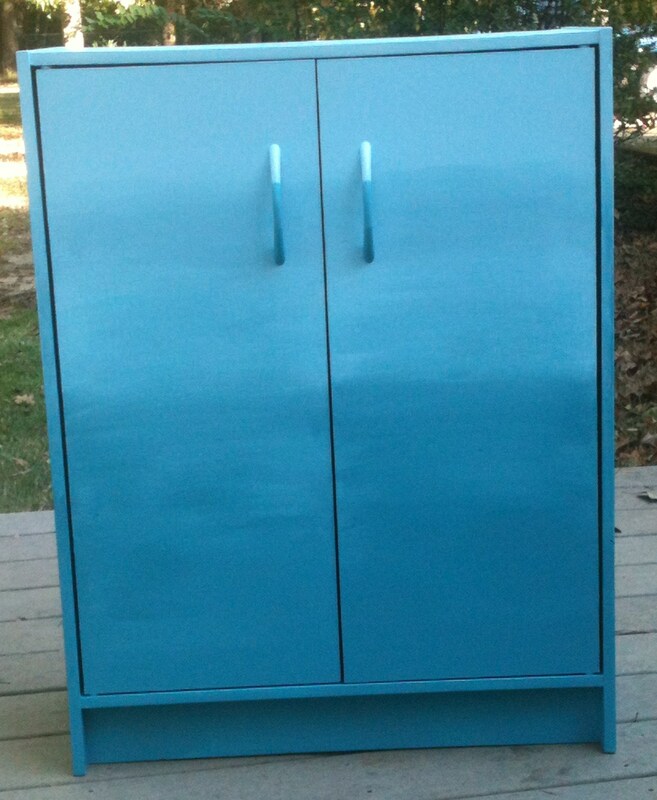 I admit that I started this project with little thought as to what I wanted to do with the cabinet, so I bought some light blue paint and just slapped it on. 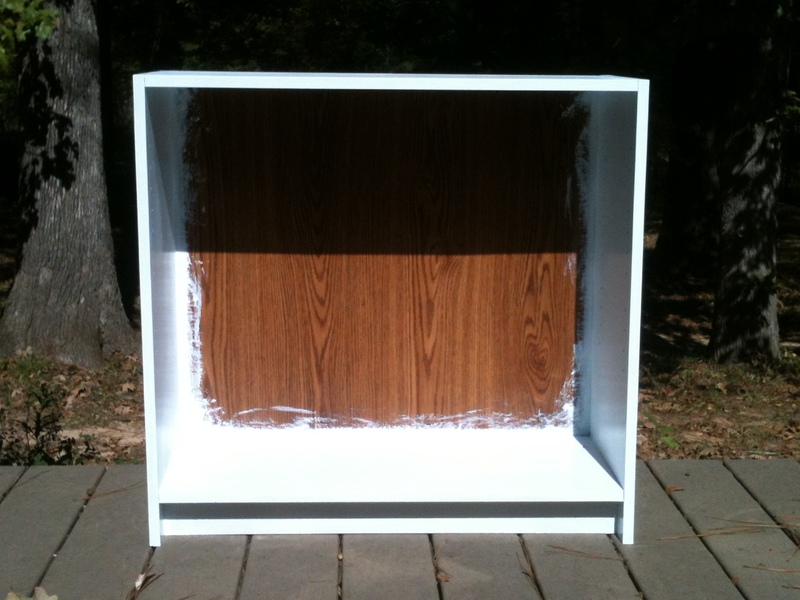 Of course, that did not work because this cabinet is laminate and the paint got scratched and peeled off. Well, after that I decided to actually take some time choosing what I wanted to do and how I was going to do it. After seeing many different pictures of furniture painted with an ombré fade, I decided that’s what I wanted to do. Materials: You’ll need a hand sander, tack cloth, primer, at least 2 paints, paint brushes. Remember to seal it with polyurethane. Process: Since I did not want to ever deal with peeling paint again, I sanded the cabinet, then wiped it clean with a tack cloth. 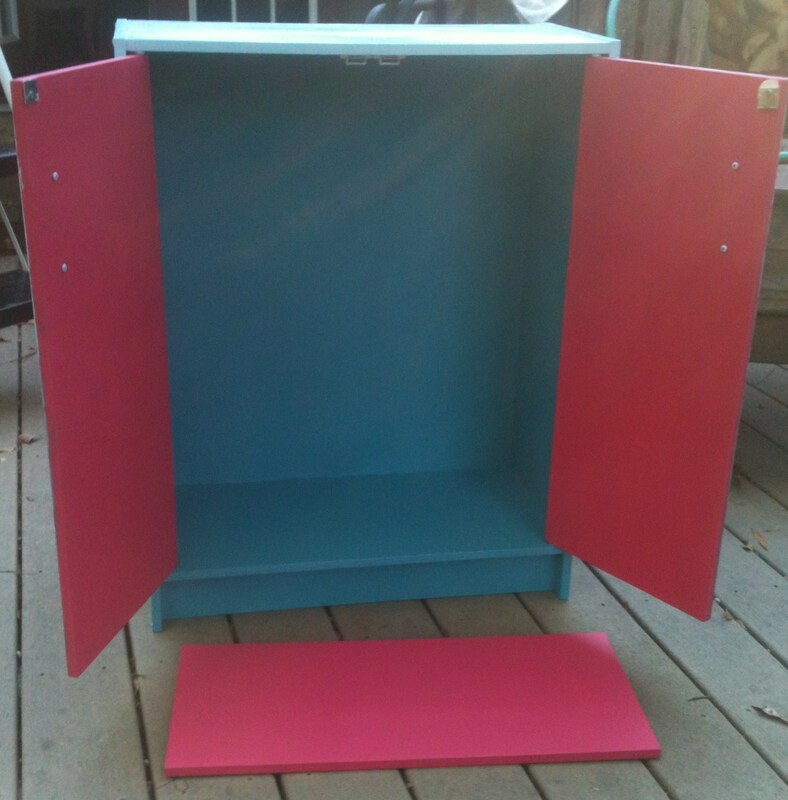 I primed it with oil-based Zinsser and painted the inside of the cabinet Orchid Rose (all of my paints are by Behr). I think it really pops against the blue and green. I then painted the top half with Winsom Hue (blue)and the bottom half with Lagoon (green) and used a clean, wet paint brush to blend the middle sections together. The sides actually blended better than the front, which worked out because I like the wispy-look of the doors. I chose the blue and green thinking it would look a little like the sky and grass. I plan to go back later and paint a floral and butterfly design on the front in the same bold pink color as the inside. I would post a picture of the completed project but I found the design online before I knew we’d be making this blog, and I don’t want to get into any copyright issues. I would come up with my own design but I am already in love with this one. And you know how it is when you’re in love with something and can’t get it out of your head. Nothing else will ever be good enough. So, I apologize that you don’t get to see the finished product, but if you are really interested you can email us at artthoucrafty@gmail.com, and I will send you a picture when it’s finished.